Amazon stock the Sony XDR-S60 in white, black or red. Co-op Electrical Shop also store the black finish XDR-S60. This quality Sony DAB radio runs on batteries or mains power, freeing it from the kitchen or living room. It has been available for a while, but worth a second look if you want a reliable and futureproof DAB radio. The XDRS60 DAB has 5 direct-access memory presets for storing favourite stations. There's an FM tuner, too, if you'd rather BBC Radio 3 on analogue radio. The Sony has a clear array of controls to access stations and menu options, plus a rotary dial to scroll through the station list. A telescopic aerial and tuners covering both DAB/DAB+ and FM wavebands pull in as many stations as possible. There's a useful headphone socket and you can connect an MP3 player or other audio device via a 3.5mm audio input socket. 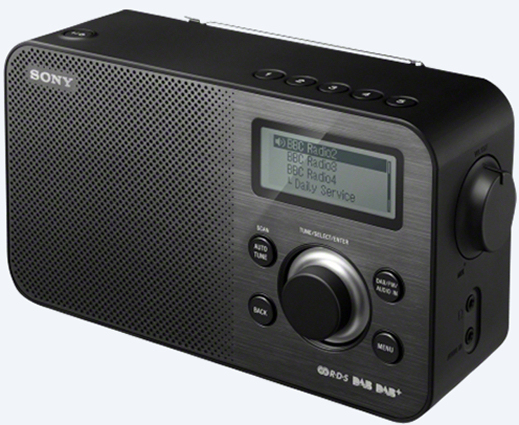 The Sony doesn't have an alarm (you might want to check out the August MB400 if you're missing such a feature), but pop 4 "C"-size batteries into the radio and take it out and about with you, for uo to 16 hours' use on one set, before you must reach for mains power again. If you don't want to buy "C"-size batteries, just use some AA rechargeables in a battery size converter and you can take this Sony DAB radio out and about (though not use it for as long). 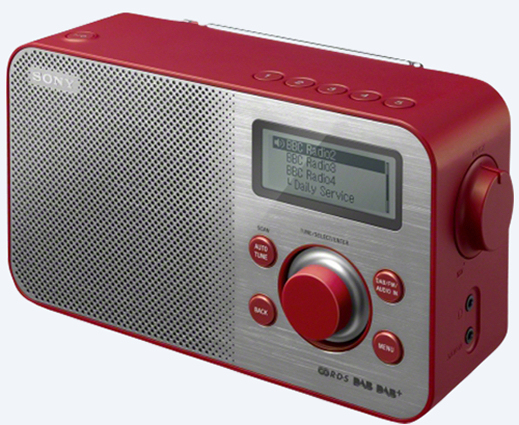 The 'S60 radio is available now at under £70 - check the left-hand column to find out where to get one, in red, white or black.